Nick Clegg, the Deputy Prime Minister of Britain, called Israeli settlements “deliberate vandalism” at a press conference Tuesday, with Palestinian Authority PA Chairman Mahmoud Abbas standing at his side. His condemnation of Israel, one of the harshest ever from a senior British official, was welcomed by Abbas, who said it was exactly what we had waited to hear officially." Britain, like the United States and almost every other Western country, does not recognize a Jewish presence in Judea and Samaria and in areas of Jerusalem claimed by the Palestinian Authority. 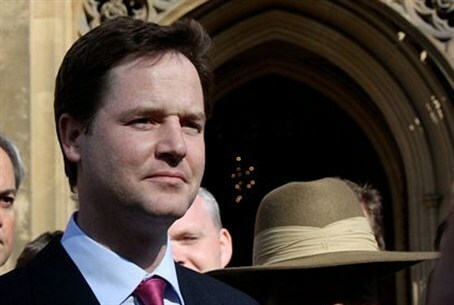 Clegg’s use of the term “vandalism” represented a sharp escalation and undiplomatic language towards Israel. He accused Israel of undermining the “peace process” by not agreeing with Abbas’ demands to halt building new homes for Jews in Judea and Samaria. Clegg justified his rhetoric and was quoted by the London Jewish Chronicle as saying, "Once you've placed physical facts on the ground that make it impossible to deliver something that everyone has for years agreed is the ultimate destination [peace via a two-state solution] ... it is an act of deliberate vandalism to the basic premise on which negotiations have taken place for years and years and years. And that is why we have expressed our concerns as a government." The peace process has evolved not a long and drawn out diplomatic attempt to grant the Palestinian Authority all of its territorial and political demands under the guise of “negotiations” but which are in essence an ultimatum to Israel. The Palestinian Authority has said that if Israel does agree to its terms, it will make another attempt to win recognition on its terms by appealing directly to the United Nations. Abbas’ latest international junket includes a meeting with British Prime David Cameron, and Foreign Secretary William Hague.